I spent several summers in England in the late nineties competing with the U.S. Equestrian Team, and while there I briefly visited Scotland several times to ride in a Horse Trials at Thirlestane Castle, in the Scottish Borders region. 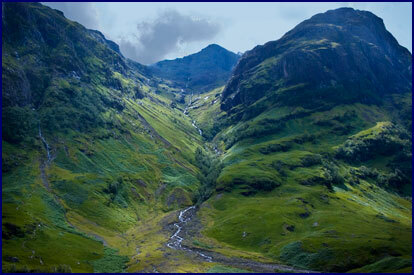 I was struck by the beautiful scenery, and had always hoped to return to Scotland some day when I had time to explore. My friend Jineen and I like to take a trip together every year; it works out perfectly, because her husband doesn�t really like to travel, so the two of us go off touring the world together. When the question of where to go this year came up, I suggested the Highlands of Scotland; Jineen agreed, and soon we were on our way. We flew overnight to London, arriving at Heathrow early in the morning, bleary eyed and tired. When it came time to board our connecting flight to Edinburgh, we discovered we had not had our �security photos� taken - due to a snafu we had been directed to the wrong line. This necessitated returning to the original security checkpoint, butting in to the head of a long queue, and then racing back through the airport, to arrive gasping and sweaty at the gate just barely in time to board our flight. Off to a good start! We arrived in Edinburgh mid-morning and picked up our rental car, and then headed west; allowing time for a little sightseeing, we had a six hour drive ahead of us. We went through the town of Stirling, where a large and sprawling castle sits atop a high steep ridge overlooking the town. Stirling was quite crowded so we didn�t linger, but following the signposts to get out of town proved challenging in our sleep-deprived state; after three times around the �roundabout� we finally found the motorway. . . The mountainous region that covers the north and western part of Scotland is known as the Highlands, and this was our destination. 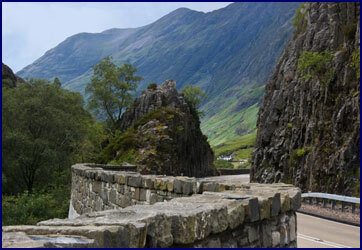 The winding road took us through a series of long steep valleys, known as glens, each containing a deep narrow loch. The scenery was quite beautiful, but by this point we were too tired to enjoy it much; it took most of my concentration just to keep the car on the left side of the road. Aside from a couple of small scenic detours and some excellent fish and chips from a take-away in Calendar, we kept on driving. Eventually we came to Port Appin, a small town north of Oban, right on the shore of the Firth of Lorn, an estuary that leads out to the Atlantic. As we neared the water we had a good view of the Castle Stalker, a small four-story stronghold that is thought to have been built around 1440. It sits alone on a tiny island, accessible only by boat � we could see that in feudal times this would make it easier to defend. We were booked for two nights at Fasgahd, a little B&B right by the water. (We were to find that most places in Scotland have unpronounceable Gaelic names.) It was a very pleasant little white house with sheep in the yard and chickens by the front door. 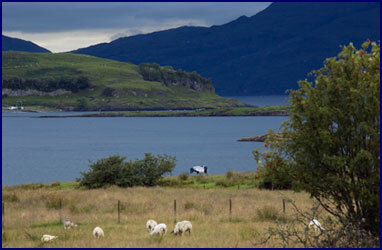 There was a pinto pony down by the shore, and a beautiful view of Lismore Island across the water. We went for a walk along the road into town. There was a stiff breeze blowing, and dramatic shafts of light broke through the clouds as the sun set. Returning to the B&B, we had �happy hour� in our room, dining on supplies we had picked up on the way; cheese and crackers with chutney and a good bottle of Italian white wine. We were in bed by 9:30, and slept like logs. It was raining in the morning when we awoke, rested and ready to go. We had a nice cooked English breakfast at the B&B, and got some good tips about where to hike from another guest there, Bryan . 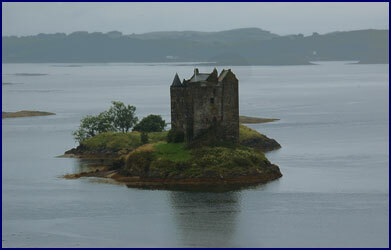 We headed out, stopping briefly to admire Castle Stalker in the morning mist. At the end of the road, we parked and hiked the Steall Falls Trail. We followed the path up through the forest along the side of the ridge, overlooking the rushing stream far below. Soon we were climbing among huge boulders. Eventually the path descended again to the side of the burn (Scottish for stream), where the rushing waters had hollowed out bizarre craters in the boulders. We passed through a narrow gap between a rock cliff and the stream, clambered over some large rocks, and came out into an open meadow. 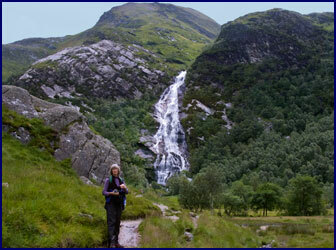 We could see Steall Falls before us, a veil of white cascading down the sheer mountainside. We crossed the meadow, following the path along the stream toward the falls. It was amazingly beautiful, with rugged mountains towering above the 400 foot high waterfall. Months after returning home, I was watching a Harry Potter movie on TV and I recognized the huge waterfall in the background. 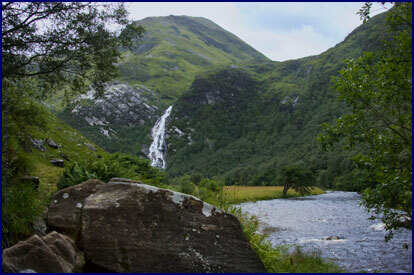 Sure enough, I checked it out on the Internet, and the scene where he is battling a dragon in the movie was filmed at Steall Falls . Though not exactly crowded, the path to the waterfall was popular; we saw a number of other hikers along the trail. 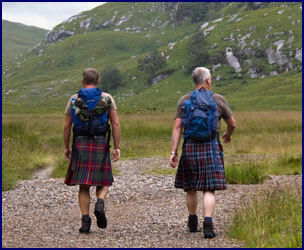 The most notable were two Scotsmen wearing kilts; they appeared to be serious hikers, and very comfortable in their native garb. Unfortunately we were not able to check what they wore underneath them . . .
We turned toward the base of the falls, but we soon came to a very questionable bridge across the swift stream. It consisted of a single metal cable spanning the 60 foot distance over the water, which one would cross like a tightrope walker, with another pair of cables higher up for handholds. 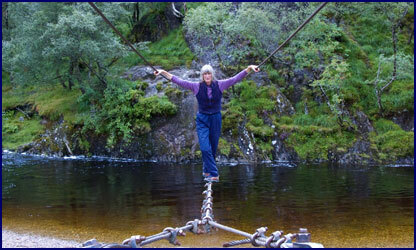 Jineen went across it quite agilely, but I declined - I have crossed plenty of rickety swing bridges on hikes, but they usually at least have planks to put your feet on. Leaving Glen Nevis, we headed north and drove through Glen Coe. It was spectacular. �At the top of the glen a beautiful waterfall cascaded down from a swiftly flowing burn, and the road followed the river down through the long valley. Rugged mountains rose on either side; their steep slopes were green, but rocky and a little barren. �Mist moved over the peaks, and silver streams tumbled down the sheer slopes from dizzying heights. Glen Coe is considered one of the most beautiful places in Scotland , and is a designated National Scenic Area � and we could see why. It was like all of our best dreams and imaginings of what Scotland would be like rolled into one. The history of the place felt near. The grim grandeur of the mountains and the dramatic landscapes evoked images of the battles that took place here in centuries past. I could almost see hoards of kilt-clad Scotsman come screaming down out of the misty heights, hair flying, claymores waving, bagpipes playing wildly as they joined in battle . . . . Obviously I had been reading too much Diane Gabaldon. We passed a small single-lane road that turned off to Glen Etive; it looked intriguing, but we had a lot of ground to cover so we passed it by. I regretted this later, and wished we had taken the time to explore it. 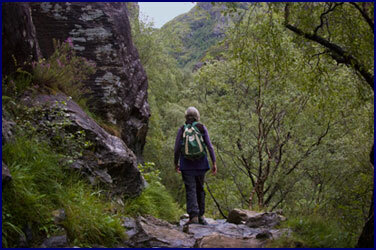 Because the area is so famous and popular, we had not planned to stay at Glen Coe - we really like to find the untrodden paths - but after leaving its spectacular beauty we were a little sorry we hadn�t stayed. We passed through the picturesque town of Killin, with its old Roman Bridge and wide waterfall right in the middle of town. 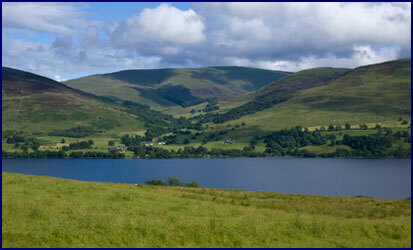 We turned north to Glen Lyon, and followed the small road through the glen to Loch Lyon. Jineen and I always like to explore the smallest roads we can find - we were in our element here. The road was paved, but it was a single lane, with designated �passing places� every couple hundred meters; if a car was coming from the other direction you had to pull over in one of these miniature lay-bys and wait for it to pass you. If your timing didn�t work out just right, this often involved one of the vehicles going in reverse for some distance. Glen Lyon was lovely. 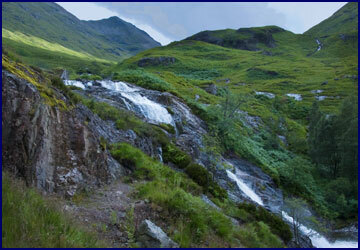 It was lush and pastoral, in contrast to the rugged wildness of Glen Coe. There were idyllic farms and estates along the road, though not too close together, and areas of forest. We stopped and watched a farmer herding some sheep with an enthusiastic border collie; a second dog sat tied on an ATV eagerly awaiting his turn. We came to a pasture where several of the famous Highland cattle grazed. 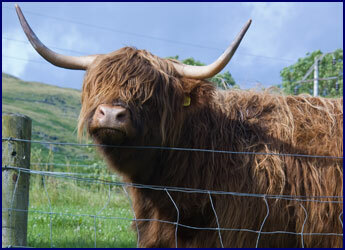 A large bull cooperatively posed for us by the fence; his incredibly thick long fur was evidence that he could withstand the harsh Scottish winters, but with his hair completely obscuring his eyes, it was not clear how he could see. 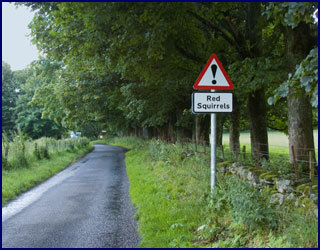 We passed a caution sign that said �Red squirrels, next 11 miles.� We saw a deer and a hare, but no red squirrels. We drove all the way to the end of the glen. The further we went the less populated it was, and the landscape was more open and wild as we climbed in elevation. We came to Loch Lyon, which had a large dam, apparently some sort of hydro-electric power station. Our map showed the road to be a dead end so we were intending to turn around at the dam and backtrack, but we saw a little sign that pointed up a small lane marked �to Killan,� so we decided to give it a try. Looking back we saw a rainbow over Loch Lyon, so we figured it must be the right decision. A little while later we were not so sure. The tiny road wound up through the hills, roughly following the power lines from the dam. As we went on, the quality of the road deteriorated. The tire tracks were still paved (they didn�t seem to have gravel roads in Scotland ) but full of potholes. The further we went, the smaller the road became, and the bigger the potholes - we couldn�t tell if our route would go on through to join civilization or come to an abrupt dead end in the middle of some trackless bog. �Our type of road! Eventually the little track descended into Glen Lochay and we were able to join the road there, thus completing the circuit. By the time we headed back toward our B&B it was getting late. 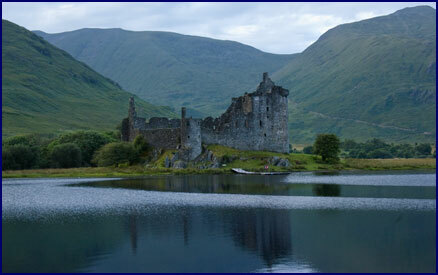 As we passed the beautiful Loch Awe, we turned on a side road in search of Kilchurn Castle. We parked the car and walked down through a field to the edge of the loch, where we could see this grand castle ruin across the water, regal in the gathering dusk. It sat on a small peninsula, mostly surrounded by water. �It had a little dock for boats, but we couldn�t tell whether or not it was accessible by foot. It was lovely and peaceful, looking out across the loch in the fading light, and it felt a little magical. There was a small grave by the water for a dog named Foop. 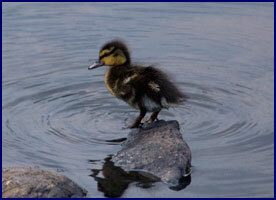 A baby duck swam along the shore, not more than a few days old, all alone without its mother. We stood there for a long time.